A vast amount of information resides inside images, photographs, paintings, diagrams and drawings which can be seen but not searched. It is waiting to be discovered but has been inaccessible to traditional query methods. Visual images are an indispensable medium for transmitting knowledge and provide a valuable complement to textual information. OASIS from Synaptica is an exciting new way to unleash the information previously locked inside image content. OASIS stands for Open Annotation Semantic Imaging System, a software application that lets you dive deep inside any image to highlight and annotate points of interest at specific coordinates and levels of zoom. 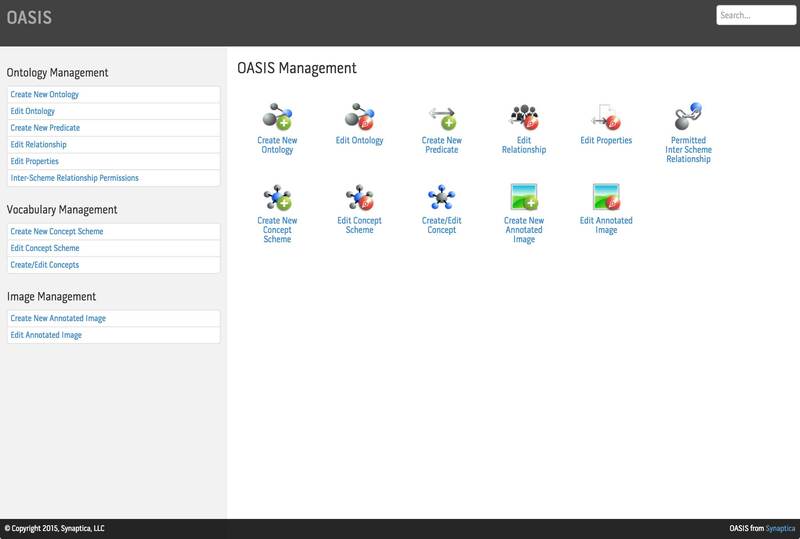 OASIS is a Linked Data application that enables the visual features of an image to be individually identified and expressed as Linked Data URIs. These features can then be semantically indexed to internally- or externally-curated controlled vocabularies. OASIS builds up an interactive map of the visual features and the conceptual ideas contained in images. With OASIS you will be able to pan-and-zoom effortlessly through high definition images and see points of interest highlight dynamically in response to your interaction. Points of interest will be presented along with contextual links to associated images, concepts, documents and external Linked Data resources. 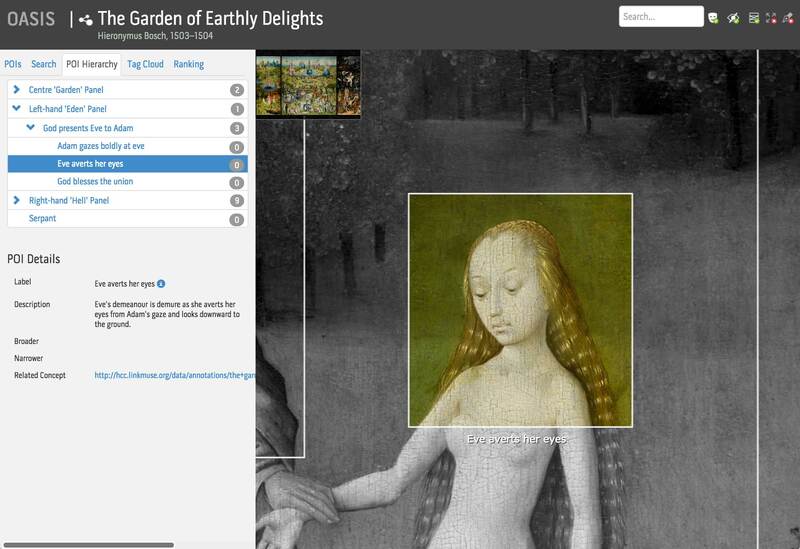 Faceted discovery tools allow users to search and browse annotations and concepts and click through to view related images or specific features within an image. OASIS enhances the ability to communicate information with impactful visual + audio + textual complements. OASIS from Synaptica will empower information providers with a powerful new interactive discovery tool and has applications in many industry sectors: publishing and education; museums, libraries and archives; scientific and medical research; engineering and architecture; media and creative design; defense and intelligence; law enforcement and forensics; insurance; real-estate; satellite image analysis; geological surveying; and many more. The application is built using open industry standards and designed to maximize ease of integration with other content management tools and components. Contact the Synaptica Team to arrange your demonstration. 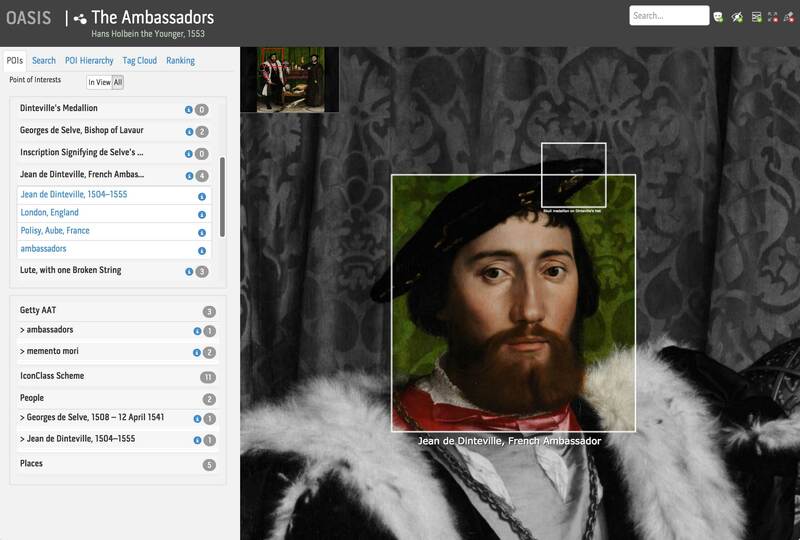 LINKED CANVAS helps people to explore artworks and artefacts visually, conceptually and contextually. The solution is an implementation of Synaptica’s Open Annotation Semantic Indexing System (OASIS), which has been developed to help the cultural heritage community create engaging interactive content that will showcase individual artworks, collections and special exhibitions. How LINKED CANVAS works is as important as what it can do. LINKED CANVAS is built from the ground up using open data standards that enable content creators to maximize data portability and minimize vendor lock-in. The Linked Data architecture provides a framework for cross-institutional collaboration​, community engagement and knowledge sharing. Visit the Linked Canvas website.